This is the class that will get you started! 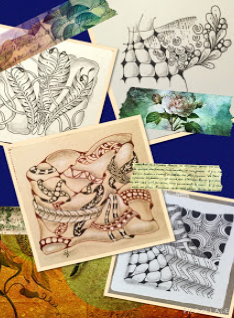 You will learn the theory and process of the Zentangle® method. All ages and levels are invited, and absolutely NO artistic experience is needed, just the wish to try something new and have fun! You will learn 8 basic tangles and create 2 of your own unique tiles. Most people find the process of creating a zentangle to be calming and relaxing. When following Zentangle method there is no 'right or wrong' or 'up or down' and we have no expectations about what the final piece of art will look like. Relieved of any expectations we are free to relax and become absorbed in the creation of patterns. The repetitive nature of zentangle can help the brain to switch off other thoughts and achieve a state of relaxed focus similar to that found in other meditative methods. Anyone ~ even if you are convinced that you are not “artistic”! If you can draw a line and a circle, you can create Zentangles! This is an activity that can be shared and enjoyed by all ages and abilities.